un immense honneur, dont il nous faudra rester dignes. Thank you for accepting my friends request my new young friend, and again it is true that you and your group have left a deep lasting impression, upon me. That I shall never forget and I'm so very proud of you all, as a young 1/509th Airborne Infantry Battalion Combat Team member. Myself during the now forgotten Cold War that was the only U.S. foreword deployed, Airborne unit in the world at the time. That was much later called- America's Foreign Legion, we like you and your group had the impossible task then, of walking in the footsteps of legends. 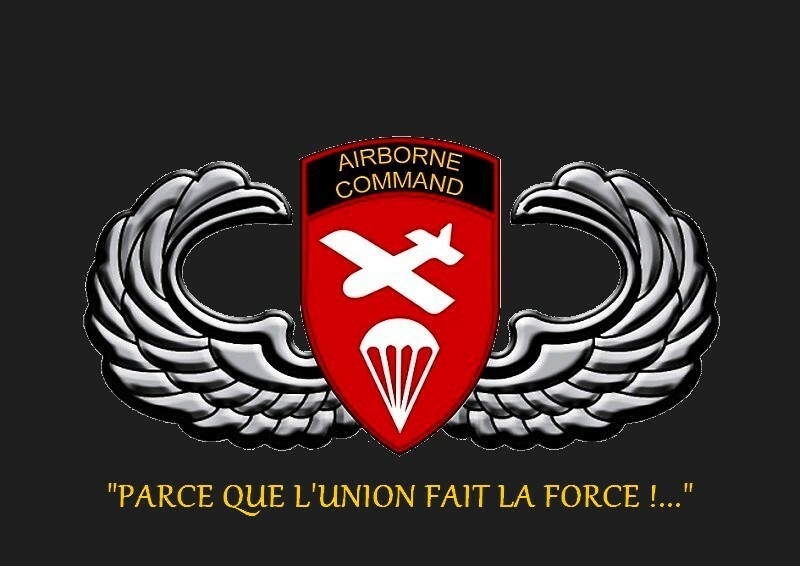 That being the founding WWII fathers of our unit and of the most legendary unit, in America's small Airborne community. In WWII they force marched 35 miles in 11 hours as a entire unit, before leaving to make the first combat jump in U.S. military history, into North Africa. In 1976 my 1/509th unit broke this record by force marching, 36 miles in 11 hours but it broke us with 18 year olds now walking like, 100 year olds at the marches end. This record remains unbroken today though by any 509th unit, walking in the footsteps of legends its seems is not for the week. Enclosed I'm transmitting some images for you, and firstly I was at the fireworks that night as you can see. Next this is a rare picture taken only this year, of the two active small sister 509th battalions. In Louisiana with the Luisiana based 1/509th BN to the left, and the 3/509th BN based in Alaska to the right. The 3rd picture is one of the many designs I've personally done for the 509th Association. With all known unit patches worn by 509th units, from 1942 to today and I'm headed to the 509th PIA reunion, on the 2nd of this Sept. I'm going to request in our Association reunion meeting their, that we build and maintain stronger ties to your magnificent group. For the future along with finding small ways to further show, our appreciation and support for all that your group does to honor, our units gallant founders. Gentlemen please note here that many of these young Frenchmen, are ether currently serving in the French military or are veterans of it. As history reenactors they so mobile bring the living history to life, of the memory of the young U.S. Paratroopers that once came from the night sky, to help liberate their nation. In this they are also living reminders and educators, to new French generations to come to never forget the generation, we once sent to them to risk and sacrifice everything for liberty. They do this too at great personal expense and time to get it exactly right, in their U.S. WWII airborne reproduction vintage personal weapons and equipment. Also going as far as risking their own necks in doing demonstration jumps their, without any payment or thought of reword. I have personally witnessed their hard training to get it right, in their great attention to detail to fully honor the once young U.S. paratroopers, they now portray in France. With this I can tell you that if operating in formation or maneuvering, in the field their degree of attention to detail and discipline in this. Even when they know no one is looking never departs from caricature, as impressively operating at all times as only elite U.S. airborne soldiers would. They truly are in every sense the ambassadors of our nations best, that we once sent to them from the night sky so long ago, and in this. Only represent the best and noblest of their of their own nation, while deeply honoring the best our own nation once sent to them. They are fully deserving of only our full respect support and admiration, and to them I say- viva la France!